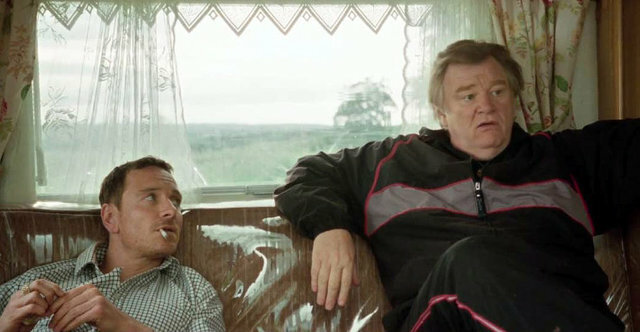 Michael Fassbender and Brendan Gleeson make an electrifying lead pair in Adam Smith’s intimate and incendiary drama about the travelling community. Chad Cutler (Fassbender) is trying to break his family away from the vice-like grip of his father, the local patriarch Colby (Brendan Gleeson). As Chad struggles to play it straight, his father is always there to pull him back in for ‘work’. His latest job is the theft of some high value objects and it could land him into some serious trouble with the local law enforcement. P.C Lovage (the ever reliable Rory Kinnear) has an axe to grind with Chad and this could be the perfect chance to send him away for good. The strength of the film comes from two powerful performances from Fassbender and Gleeson. Accurately portraying a travelling community at odds with the world around them whilst hustling to survive, Trespass Against Us is a story about family ties and how a strong bond of blood can be lead to downfall. The father-son dynamic is wonderfully explored with the character of Colby. Gleeson has fun playing the figurehead of the community who’s equal parts funny, entertaining, stubborn and extremely dangerous. His exchanges with Fassbender, especially regarding Colby’s take on the world is fascinating to watch. The supporting cast are all solid too with Lyndsey Marshal quite brilliant as Chad’s long-suffering partner Kelly who just wants a better life for her family. Young Georgie Smith does a great job as their son Tyson, a boy who’s caught in the middle of a power struggle between Colby and Chad. Perennial bad-guy Sean Harris suitably obliges – this time as an unhinged reprobate who has pyrotechnic tendencies. Involving and even funny at times, the film also has some amazing car chase sequences, but it’s the themes of family honour and commitment that leaves the most profound mark. The script by writer Alastair Siddons bubbles with genuine verve and tact, painting a wonderfully detailed and tragic picture of missed chances, with a fervent love of the family dynamic. Trespass Against Us is a gem of a film and one that deserves your time and attention.